As we edge closer to the playoffs, some teams are gaining incredible momentum while others find themselves losing steam. This week’s rankings feature a new No. 1 team that is among those making a considerable push toward the postseason. The Chiefs (6-5) have claimed the No. 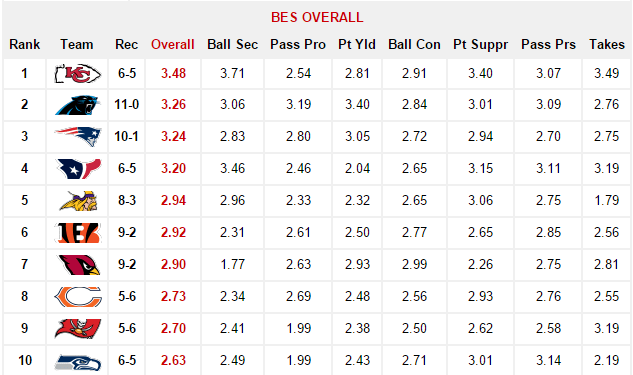 1 spot atop the BES Overall rankings with a score of 3.48, the highest overall score registered by any team this season. 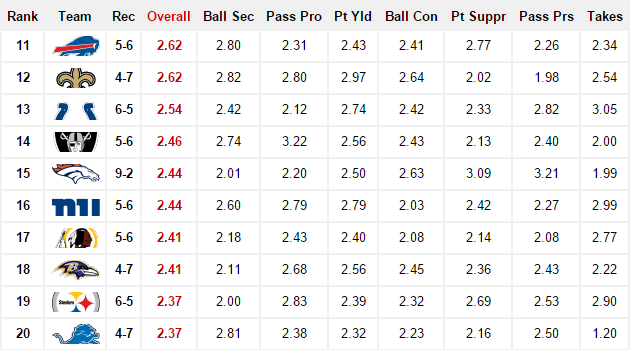 They are head and shoulders above all others in Ball Security (3.71), Point Suppression (3.40) and Takeaways (3.49). They’re also No. 2 in BES Offense and No. 1 in BES Defense. As a whole, the Chiefs have been playing some truly impressive football as they continue to navigate the final stretch of the regular season. The Patriots, meanwhile, have fallen to No. 3, their lowest ranking of the season. This comes on the heels of a dramatic 30-24 loss in overtime to the Broncos (9-2) in Week 12. The Patriots are hurting offensively with basically all of their key offensive weapons out with injury. As a result, they’ve also fallen in BES Offense from No. 1 to No. 3 with a score of 2.85. 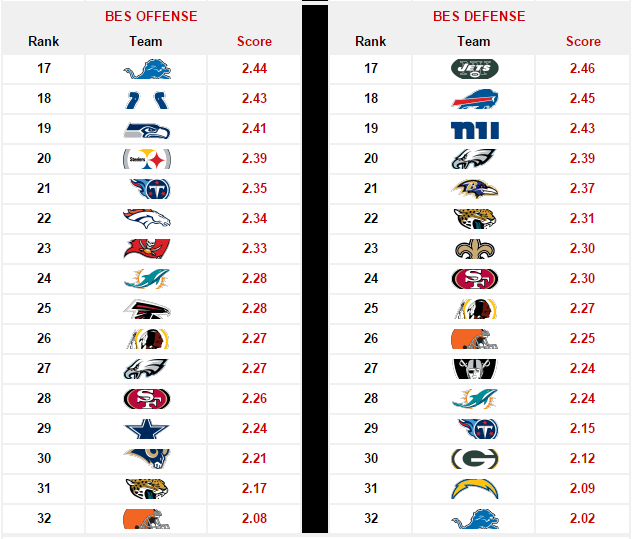 However, their defense is gaining strength, ranking fourth in BES Defense with a score of 2.78. They are not as explosive as they were earlier in the season but they are definitely more balanced. Roy Christopher Moore…I don’t know what this means..
Just weeks ago everyone was wanting Alex Smith out! Wtf…. Another report just out Carolina at #1. That makes more sense to me. I think the Raiders are only team that are gonna test Chiefs number one rankings. Only team I see that really been battling other teams through the thick of things. Yes…the Raiders are always a tough draw for the Chiefs, especially in Oakland. It will be a difficult game for the KC. They can not afford another key injury like Patriots unless we get more people like West back in action. No they dont. But in my almost 10 years compiling this data each season, every team that has been No. 1 in the BES has made it to the playoffs. 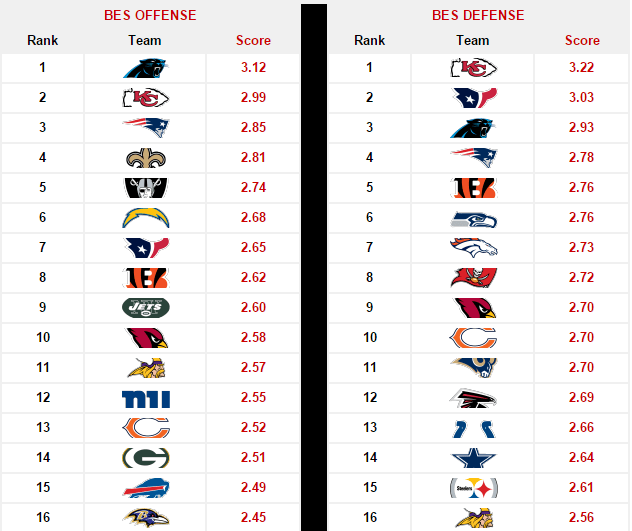 The Chiefs are only the fourth team this season to rank atop the BES. The others are the Broncos (Wks 2-3), Patriots (Wks 4-8, 10-11) and Bengals ( Wk 9). 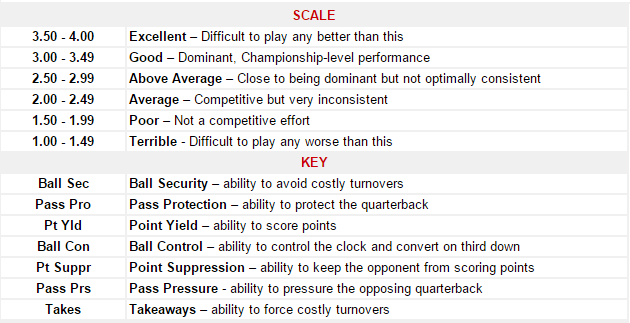 Next week is the test though.. At Oakland and they by the bes ranking has a good offense..
All I can say is wow ! I hope this time for sure we give it full throttle n dnt let off til the end ! Rick Miller – Panthers are #1.in record but the Chiefs have been playing better over the last month or so…mdre.impressive wins. Also teams the Chiefs have beaten are playing well…Texans, Broncos, Bills…even Detroit. This is not to say the Chiefs would beat the Panthers if they played. 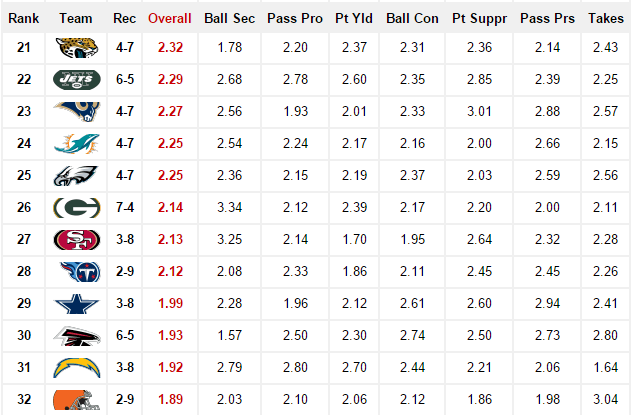 It’s just saying the Chiefs have.more momentum than anyone else in the league right now.